"You cannot surrender, you cannot give up. You should fight to the last second," the young Israeli boy said after scratching his head and thinking for just a few seconds. He was talking about what he had learned from his tour of Masada, the ancient site where a band of Jewish rebels once held out against the might of the Roman Empire. The tour prompted a similar conclusion from one of his female classmates: "It's really important to stand up for yourself." They want us to vanish from the world. But it will never happen. Masada will never fall again! "Especially now that we're at war. We need to do whatever it takes," she told me. It is something of a rite of passage for Israeli schoolchildren - a trip to Masada - as obligatory a part of their upbringing as exams and sports days. And Masada is a remarkable story, albeit one that is mired in legend. The rebels, or Zealots as they were known, are supposed to have held the Romans at bay for several years before retreating to their final hold-out in about 70 AD. Then, rather than be captured, they committed collective suicide - men killing their own families, afterwards each other, until one remained to kill himself. "We want to show the children that this place is where people fought for their freedom, that you have to fight for your freedom, and give even your life," one of the teachers at Masada told me. She makes an explicit connection between what happened at Masada and Israel's present conflict in Gaza. "They want us to vanish from the world. But it will never happen. Masada will never fall again!" I asked her if it was not perhaps manipulative to teach such a profound and unsettling lesson to young children. "No," she insisted. "it's just realistic." The lesson certainly seems to have been drummed in successfully. Almost every Israeli visiting the site had memories of earlier trips as a child, and they all felt that Masada was no mere legend of history, but a living story with a resonance today. A middle-aged army reservist, Motti, told me he came to Masada because it gave him strength. "This is where we know we are right," he said. "From Masada, we realise that nobody will take care of the Jewish people, that we have to take care of ourselves." Motti, like his compatriots, related Masada to events in Gaza today. "The United Nations wants a cease-fire. They just want us to stop defending ourselves." 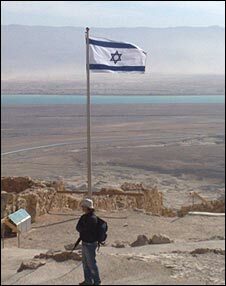 I met only one Israeli visitor at Masada that day who refused to draw such a conclusion. Rachel turned out to be something of a scholar of Masada's history, and felt the story was being misused. "I don't think you should bring people here and say: 'Look, even 2,000 years ago it was like that, and it will always be like that'." Rachel had particular worries about the message it sent to younger visitors. "Saying that all the reality you will ever know is the reality of fighting - I think it feels them with hatred." But there were no such qualms from Maria, a young PhD student. Her main concern about the Masada legend was that the Zealots had died at their own hands. "Jews have to fight for survival, not kill themselves," she said, her voice reaching a crescendo. Eternal threats and an unending series of enemies - these were clearly a permanent feature of the world as Maria saw it. "It's really about fighting back and surviving. They didn't survive at Masada, we don't want to be Masada. We have to fight - because otherwise, they are going to kill us!"